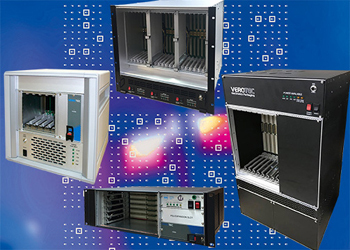 Verotec has developed eleven new models in four families of integrated development systems for stand-alone desktop or rack mount environments. Equally suitable for the hardware/software development environment and for use as the packaging for the finished system, the modular units are configured from the company’s standard ranges of enclosures, subracks, backplanes, thermal management products and power supplies. The use of standard building blocks reduces the developer’s time to market; all systems are user-configurable around the default options if required. cPCI, VME and VME64x are fully supported in all models. The D10 and D21 are desktop half- and full-width systems, supporting 6U 10 and 21 Slot cPCI and VME64x systems respectively. 9U high, space for 80mm deep rear transition modules is provided as standard and cooling fans are mounted below the IEEE1101.10/11 KM6-RF subrack. The V8, V9 and V12 are 8U, 9U and 12U 21 Slot systems based on the KM6-II and KM6-RF subracks. Designed for rack mounting 6U cPCI and VME64x systems, all variants have integral thermal management; in the V8 and V9 models a removable fan tray is mounted beneath the subrack, in the V12 an extractor fan unit mounted in the rear of the unit augments the airflow through the boards. Both embedded and pluggable PSUs are supported in the D and V units. The H Series is designed around the IEEE1101.10/11 KM6-HD heavy duty subrack for horizontal mounting of 6U cPCI or VME64x boards. The H12 is 1U high with 2 Slots, the H24 2U high with 4 Slots and the H36 3U high with 6 Slots; all versions support full width rear transition modules. The cooling arrangements vary between models, but all versions have both front and rear area cooling. Good EMC performance is achieved by the use of fabric-over-foam and beryllium copper gaskets and optimized hole diameter and spacing on the intake and exhaust cooling vent matrices. A range of different PSUs is supported. The TecSYS system is an entry-level VPX development platform to provide a basic physical environment for software development and board integration. Configured around a 5-Slot 3U full mesh X4 PCI Express VITA 46.4 backplane with VITA 46.10 RTM capability, the 6U half-width desktop system provides fat pipe communications between all five slots and an interface with one of the most widely used architectures, PCI Express.